You are here: Home / View22: Open Studio! The Jackson Hole Land Trust is excited to announce the fourth year of the View22 Project which once again unites art and conservation with local artists creating place-based art on JHLT protected properties to raise awareness of the importance of open space protection. 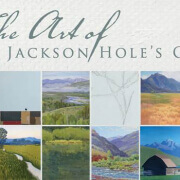 The concept for 2016 – View22: Open Studio – is an exploration of Jackson Hole Land Trust properties that are open to the public and/or access friendly for artists as well as others to enjoy and experience. 20 local artists will be creating one or two pieces from these designated locations, accessing the Open Studio locations when the timing for conditions and schedule work for them. The artists will share their experiences painting on conservation land through stories and photos on our interactive View22 blog and the project will culminate with a final exhibit and art sale at the Land Trust’s 36th Annual Picnic on August 14th. Similar to 2015, View22: Open Studio locations will be marked with green flags in early August. View22 seeks to unite art and conservation to cultivate a deeper sense of place in Jackson Hole. By pairing local artists with iconic and treasured Jackson Hole Land Trust protected properties – and sharing these experiences with the public through blog posts, artist demonstrations, and a fundraising art show – the View22 project raises awareness for the importance of open space protection for the valley’s wildlife, community, and artists. The View22 project was launched in 2013 together with local artists Kathryn Turner, Jennifer Hoffman, and Bill Sawczuk of Trio Fine Art Gallery. An organic partnership, it was proposed to the Land Trust by the Trio artists out of recognition for the invaluable role that open spaces play in their livelihoods as artists and to portray the beautiful, dynamic protected spaces in our valley through their paintbrushes. This year’s View22 artists represent a wonderfully diverse range of local fine art galleries, studios, and independent artists: Joe Arnold, Diane Benefiel, Emily Boespflug, Elizabeth Cogburn, Scotty Craighead, Katy Ann Fox, Pamela Gibson, Eliot Goss, Dwayne Harty, Todd Kosharek, Bronwyn Minton, Erin O’Connor, Abby Paffrath, Mike Piggott, Lee Carlman Riddell, Ben Roth, Bill Sawczuk, Craig Spankie, Travis Walker, Carrie Wild, and Kathy Wipfler. https://jhlandtrust.org/wp-content/uploads/2018/07/2016-Facebook-Header.jpg 370 999 imokweb https://jhlandtrust.org/wp-content/uploads/2018/04/JHLT-Logo-Parent-300x213.png imokweb2016-06-08 00:00:002016-06-08 00:00:00View22: Open Studio! View22: 35 Places Works Now Viewable Online! View22: Open Studio Works Now Online!